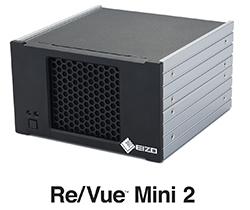 Altamonte Springs, Florida, USA, September 17, 2014 – EIZO today announced the Re/Vue Mini 2, a single channel, lossless video and audio recording solution with built-in mission-critical redundancy for air traffic control. The new product features increased internal storage capacity and dual redundant power supplies and network adaptors for long term availability. The Re/Vue Mini 2 enables single channel video and audio capture, recording and streaming of resolutions of up to 2048 x 2160 from digital (DVI-D) sources. The device adds extensive redundancy from the previous generation Re/Vue Mini to ensure continued operation through dual Ethernet outputs and two power supplies. The internal data storage has been increased to three times that of the previous Re/Vue Mini (to 1 TB), achieving an online data range of more than 90 days. Each product in the Re/Vue Mini Series can record locally in excess of 30 days and can therefore be deployed as a standalone video and audio recording device. In addition, all Re/Vue products are designed to be operating system independent and hardware agnostic in terms of the workstations which they interface to, while providing multiple interface options for seamless integration into a broader recording solution. EIZO’s Re/Vue Series of recording and streaming solutions now includes a lineup of solutions to suit the majority of typical requirements for mission-critical recording, live ATC operational centers, training & simulation, and R&D applications.